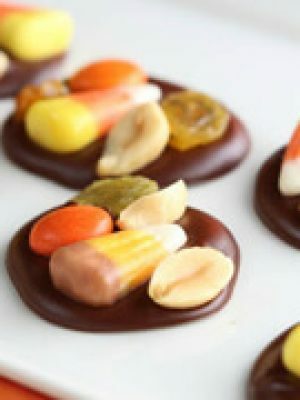 Indulge in your favorite sweet treat! 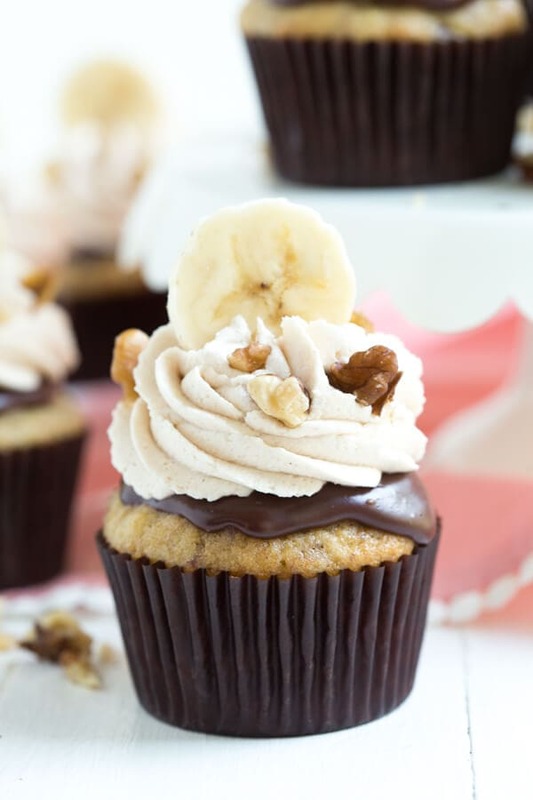 Chocolate Banana Nut Cupcakes are made with a banana nut cake, chocolate ganache and topped with vanilla cinnamon frosting. June is one of my favorite months of the year for many reasons. Not only is it the official start of summer but it’s also Dairy Month! 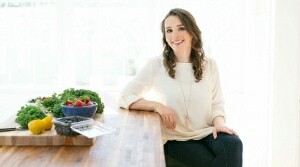 I love any excuse to celebrate cheese, milk, yogurt and more. 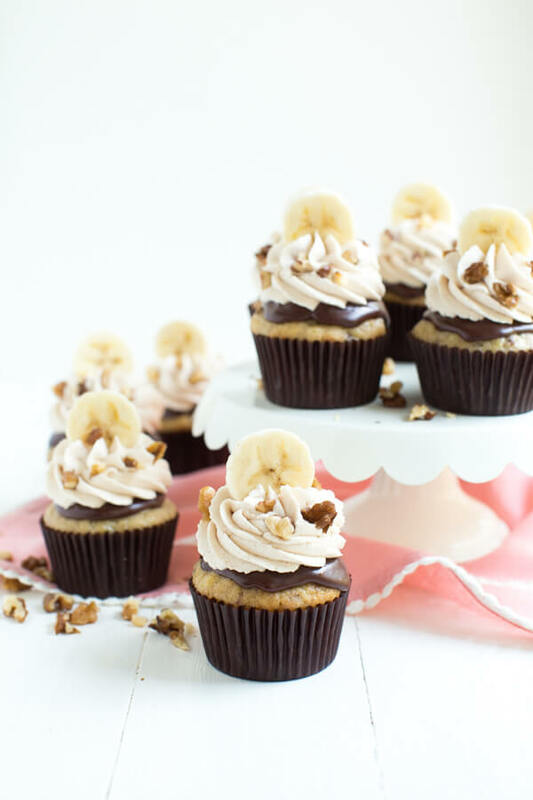 In celebration of my love for all things dairy and my love of cupcakes, I created these Chocolate Banana Nut Crunch Cupcakes. 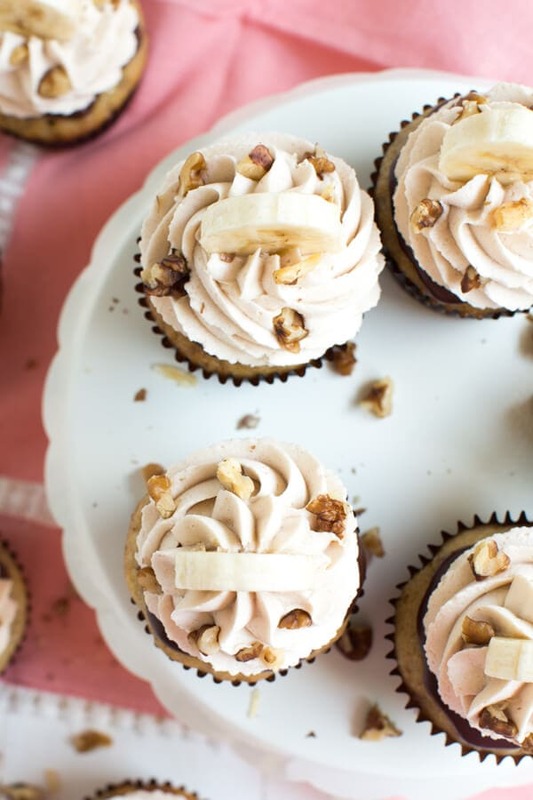 A classic banana nut cake layer is topped with chocolate ganache, whipped vanilla cinnamon buttercream frosting, fresh slices of banana and crunchy walnuts. Serve these cupcakes for a special event, dinner party or a sweet after-dinner treat. 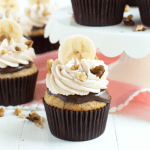 To celebrate June Dairy Month, I partnered with the National Frozen and Refrigerated Foods Association (NFRA) as part of the Cool Food Panel to bring you a cupcake recipe that you won’t be able to resist. Organic Valley is a brand that I always have available in my refrigerator. 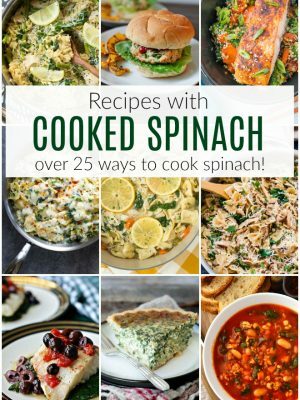 Not only do I always have staple ingredients like Organic Valley milk in my fridge, but I also love using their other products, such as half and half and sour cream, in creative ways. 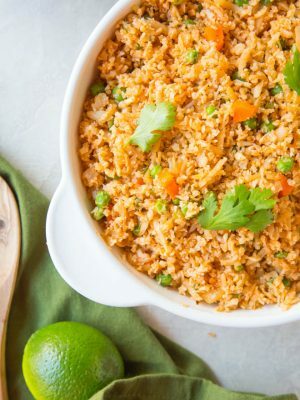 These fresh, dairy ingredients are sourced from a family of farmers and are the perfect addition to any meal. 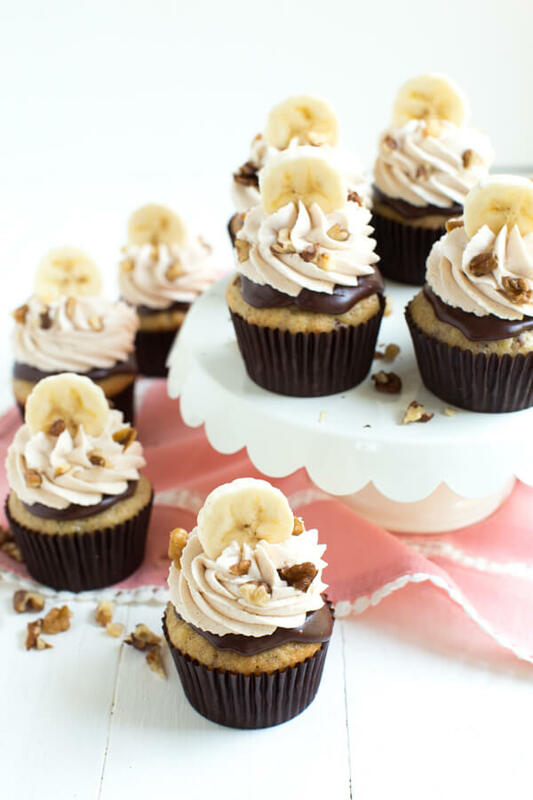 For this recipe, I used Organic Valley sour cream in the banana nut crunch cake and Organic Valley half and half in both the chocolate ganache and whipped vanilla cinnamon buttercream frosting. 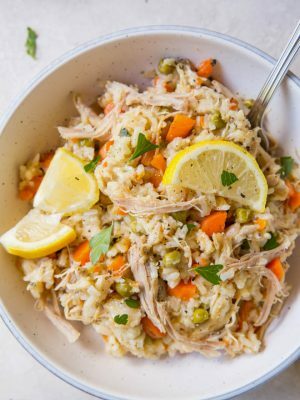 The combination of flavors is simple yet irresistible. 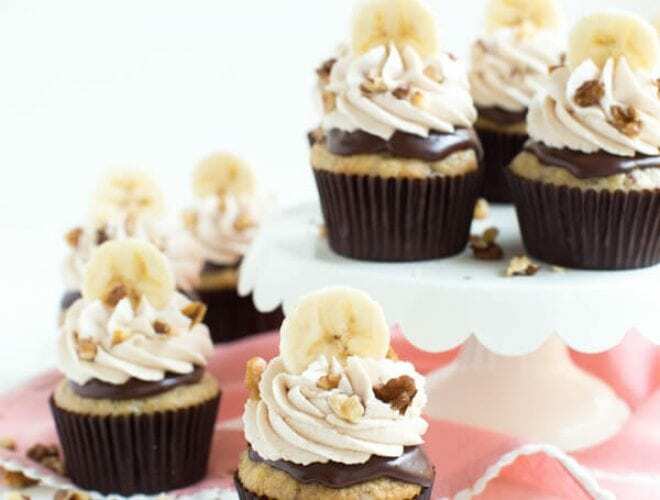 With the perfect amount of chocolate, banana, cinnamon and vanilla flavors, you will want to make these cupcakes again and again. Do you want a tip for how to ripen bananas quickly? 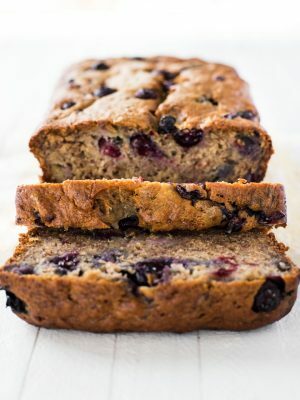 Set your oven temperature to 250 degrees F. Separate each banana and arrange them on a baking sheet. Heat the bananas in the oven for about 15 to 20 minutes, or until that start to turn a very dark brown. 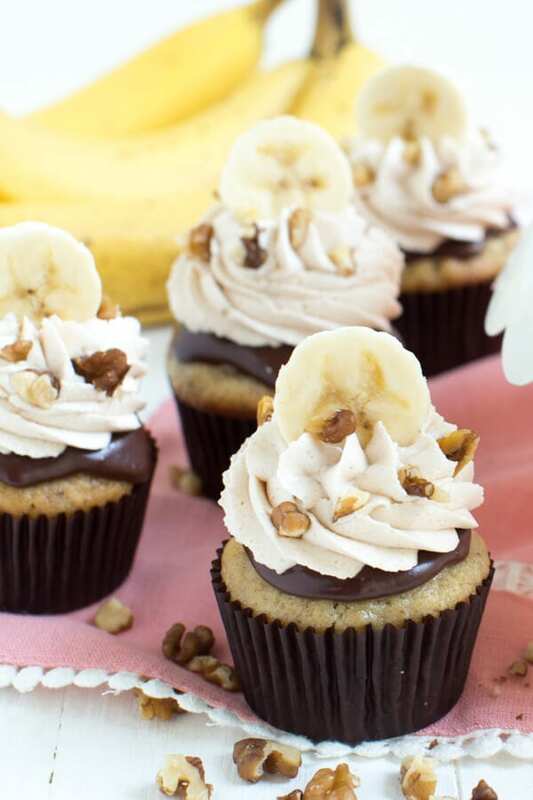 Once you remove them from the oven, you will have soft, mushy bananas that are perfect for baking cupcakes! Do you have a container of half and half in your fridge that you need to use? 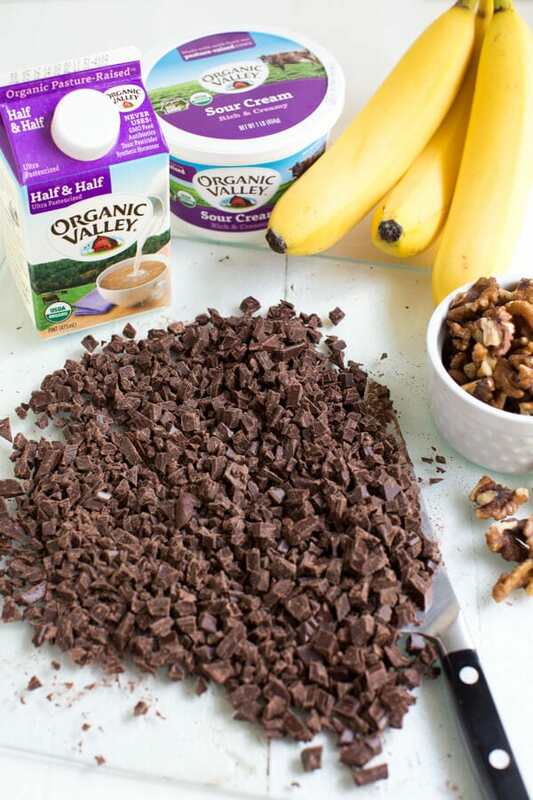 Did you know that half and half is versatile and can be used for more than your standard cup of coffee. You can use half and half instead of milk or cream in many recipes. Or for recipes like ice cream that usually call for heavy cream and milk, just use half and half! 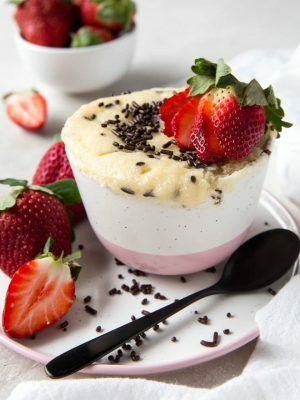 Other tasty ideas for using half and half include sauces for pasta and main dishes, mashed potatoes, oatmeal, cupcakes, chocolate ganache and more. The options are endless so don’t be afraid to pick up a carton of half and half the next time you are in the dairy aisle of your local grocery store. Preheat oven to 350 degrees F. Line two standard muffin tins with paper liners; set aside. In a medium bowl, sift together flour, baking soda, cinnamon and salt; set aside. 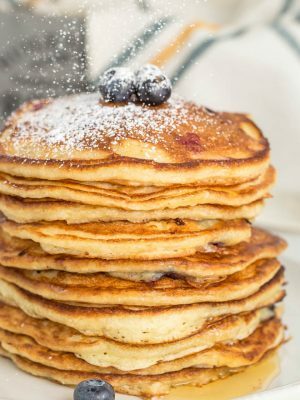 In the bowl of an electric mixer fitted with the paddle attachment, cream the butter and sugar together on medium-high speed until light and fluffy. Add eggs, one at a time, beating until each is incorporated and scraping down the bowl as needed. Add vanilla, sour cream and mashed banana and mix until just combined. Turn the mixer to medium-low speed and slowly add the flour mixture, in two additions, until combined, about 1 to 2 minutes. Fold in the chopped walnuts. Divide the batter evenly between the prepared liners, filling each about 3/4 full. Bake until a toothpick inserted into the center comes out clean, about 20 minutes, rotating the pans halfway through baking. Let cool in pan about 5 to 10 minutes, then transfer to a wire rack to cool completely. Add the chopped chocolate to a small shallow heatproof bowl; set aside. In a small saucepan, bring half and half to a simmer, stirring occasionally. Remove from heat and pour over chocolate chips. Let sit undisturbed for 8 minutes. Stir the chocolate chips together with the heavy half and half until smooth. Let ganache sit at room temperature for 5 to 10 minutes until it reaches a good consistency for glazing the cupcakes. In the bowl of an electric mixer fitted with the paddle attachment, beat the butter on medium speed for about 5 minutes. Turn the mixer down to low speed and gradually add in the confectioners’ sugar until incorporated. Add in the half and half, vanilla, cinnamon and salt and mix until incorporated. Turn the mixer back up to medium-high speed and beat for an additional 2 to 3 minutes, or until light and fluffy. Use a spoon to gently pour a small amount of chocolate ganache onto each cupcake. Let sit for 5 minutes and then pipe frosting onto each cupcake. Garnish with fresh banana slices and chopped walnuts, as desired. Enjoy! 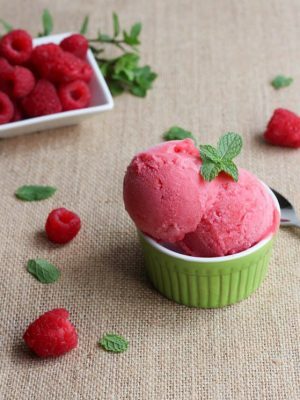 This post was created in partnership with the National Frozen & Refrigerated Foods Association to celebrate June Dairy Month. As always, all opinions are my own. Those cupcakes look so good!!! You have my whole heart with these beauties! These cupcakes look amazing! Thanks for sharing at the #InspirationSpotlight party. Shared See you again soon.